At JTEKT we offer an extensive range of premium quality Koyo metric and inch needle roller bearings. Radial needle roller and cage assemblies have a steel cage that provides both inward and outward retention for the needle rollers. The sizes are ranging from 3 mm to 165 mm bore (0.1181 – 6.4961 inch). The designs provide maximum cage strength consistent with the inherently high load ratings of needle roller bearings. Accurate guidance of the needle rollers by the cage bars is allowing these bearings to operate at high speeds. Also available are needle roller and cage assemblies using molded, one-piece glass-reinforced engineered polymer cages. Needle roller and cage assemblies are manufactured with either one or two rows of needle rollers. Unitized design simplifies handling and installation while allowing for increased lube flow. Special manufacturing processes help increase roller fatigue resistance and minimize axial drift effects in critical applications. Optimized cage piloting geometry minimizes pressure velocity effects. Steel or polymer cages are available to suit your application requirements. Coatings are available to help avoid corrosion and improve wear resistance. Drawn cup needle roller bearings are available in 3 mm to 139.7 mm bore (0.1181 – 5.5000 inch). They support radial loads and reduce friction between rotating components, with a drawn outer shell serving as a raceway for the rollers. The small cross section of the drawn cup bearing provides high load-carrying capability with minimum required space. Drawn cup bearings are easily installed with a press fit in the housing. The outer ring in the form of a cup is accurately drawn and no subsequent machining is performed to build the outer raceway. Drawn cup needle roller bearings are available in open ends or single, closed-end designs. They are also available with one or two integral seals. Other options include a single lubricating hole and matching inner ring. 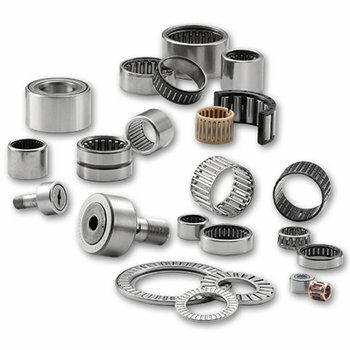 Drawn cup roller clutches and bearing assemblies are available in 3.2 mm to 35 mm bore (0.1250 – 1.3780 inch). These bearings are designed to transmit torque between the shaft and housing in one direction and allow free overrun in the opposite direction. When transmitting torque, either the shaft or the housing can be the input member. These designs use the same small radial section as drawn cup needle roller bearings and are offered as clutch-only units or as clutch and bearing assemblies. Compact, lightweight and operate directly on a hardened shaft. Installation is easily accomplished with a simple press fit. Heavy-duty needle roller bearings are available in 5 mm to 335 mm bore (0.1969 – 13.1890 inch) and have machined and ground channel shaped outer rings with a complement of needle rollers retained and guided by a cage. The thick outer ring provides maximum load capacity and shock resistance with a relatively small radial cross section. Our Stud type track rollers are available in 10 mm to 130 mm diameter (0.3937 – 5.1180 inch). The Yoke types are available in 10 mm to 300 mm diameter (0.3937 – 11.816 inch). They are characterized by their thick-walled outer rings that run directly on a track. The thick outer rings permit high load carrying capability while minimizing distortion and bending stresses. Track rollers are designed with outer rings of large radial cross section to withstand heavy rolling and shock loads on track-type or cam-controlled equipment. The outside diameters of the outer rings are either profiled or cylindrical. Profiled track rollers are designed to alleviate uneven bearing loading resulting from deflection, bending or misalignment in mounting. Stud-type track rollers are available with or without lip contact seals, or with shields. Yoke-type track rollers are designed for straddle mounting. Each yoke-type is available with both radial needle roller and cage assemblies, or with a single (or double) full complement row of cylindrical or needle rollers. High load-carrying capability with minimized distortion and bending stresses. Extended service life under conditions of infrequent re-lubrication. Our thrust bearings are available in 5 mm to 240 mm (0.1969 – 9.4488 inch) and have a complement of needle rollers held in place by a cage. Thrust needle roller and cage assemblies are complements of small diameter needle rollers arranged in a spoke-like configuration. Needle rollers are equally spaced by means of a cage whose web section separates the rollers and provides guidance to keep them tracking in an orbital path. The purpose of these assemblies is to transmit a thrust load between two relatively rotating objects while greatly reducing friction. Thrust needle roller and cage assemblies also can be unitized with lipped washers which service as raceway surfaces for the needle rollers. Washers can be supplied separately or can be mechanically unitized to the needle roller thrust assemblies for ease of handling all types have very small cross sections. If the backup surfaces cannot be used as raceways, hardened washers are available. Thrust bearings are also available with needle rollers or heavier cylindrical rollers for high load-carrying capacity. Combined bearings consist of a radial bearing (needle roller bearing) and a thrust bearing (needle or cylindrical roller bearing). They are available in 5.000 mm -70.000 mm bore (0.1966 – 2.7559 inch). Some combined bearings are constructed similar to drawn cups, but with an added thrust bearing component. Like other needle roller bearings, these combined bearings can be matched with an optional inner ring or thrust washer as the opposing raceway. An effective alternative to separate radial and thrust bearings.